Recipe by: Chef: Gary Mehigan, photo by me. 1. Cook the carrot, butter and water in a covered saucepan over low heat, stirring occasionally, for 10 minutes or until the carrot is soft (cooking under a tight-fitting lid help the carrot to cook quickly). Puree in a small food processor, then set aside to cool. 2. Mix the minced veal and pork, breadcrumbs, carrot puree and parsely (if using) in a large bowl. Season with 1 teaspoon salt and a little pepper and mould into 2cm meatballs; you should have 24 meatballs. Set aside. 3. Preheat a fan-forced oven to 165°C. 4. Heat the olive oil in a large ovenproof non-stick saucepan or enamelled cast-iron casserole. Brown the meatballs over high heat until golden on all sides, then remove and set aside. Fry the onion and garlic for 1 minute or until translucent and soft, then add the tomato paste, tomato and stock. Return the meatballs to the pan then add the thyme, bay leaves and a little salt and pepper. Bring to a gentle simmer over medium heat, then cover. Cook in the oven for 45 minutes, gently stirring occasionally. 5. Meanwhile, cook the spaghetti follwing packet instructions in a saucepan of boiling salted water until al dente. Drain. 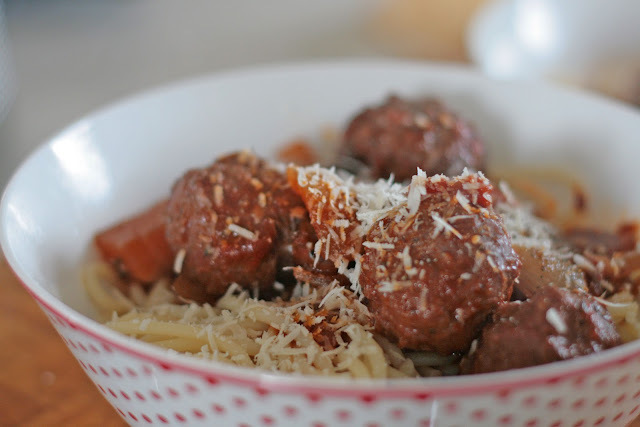 Serve the meatballs with the spaghetti and planty of grated pecorino. The spagetti I absolutley love is Martelli Spaghetti, once you have had it it is really hard to have any other brand. At around $15 a pack which should feed around 6 it is well worth it.